Families raising a child with a developmental disability or delay often find themselves at an unsettling crossroads when the infant reaches the age of 18 and the appointment of a guardian is necessary to make medical, legal and life decisions. 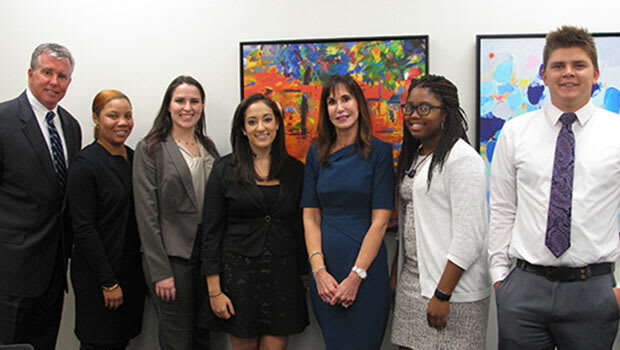 Hofstra Law’s Center for Children, Families and the Law has partnered with the Nassau County AHRC Foundation to assist families in need in obtaining the appointment of a guardian for their child with a developmental disability or delay reaching the age of 18. Through this joint effort, Hofstra Law students, under attorney supervision, represent the proposed guardian in petitioning the Surrogate’s Court for the appointment of a guardian. The Center for Children, Families and the Law was established in 2001 in response to the urgent need for more effective representation for children and families in crisis. Through innovative programs such as the Youth Advocacy Clinic and the Juvenile Justice Clinic and unique opportunities to participate in community service, public-policy projects and research, students are able to see how their studies apply in society and simultaneously make a difference. Our mission is simple: Provide Hofstra Law students with the tools they need to directly and effectively represent children and families in crisis. Supports Hofstra Law students helping families in crisis. Supports service of process of papers, which is necessary to acquire jurisdiction. Expands assistance through the work of post-graduate fellows.